Many credit the concept of hygge for the happiness of the Danes. The World Happiness Report is a measure of worldwide happiness published by the United Nations Sustainable Development Solutions Network. The purpose of the report is to encourage countries to consider happiness to be the proper measure of social progress and the goal of public policy. The first World Happiness Report was published in April 2012. Since its inception, year after year, Denmark has topped this poll. It’s been in the top ten from 2012 to the present, and it’s been ranked #1 in world happiness three out of the six years that the poll has been out (this year it’s second, after Norway). So, what makes the Danes so happy? One of the secrets to Danish happiness is a concept known as hygge. In short, hygge means to live cozily. But it’s more than that. It means slowing down, noticing the present, and enjoying it. 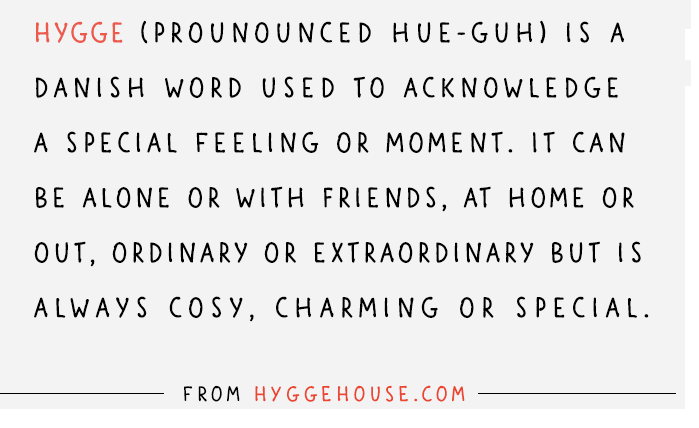 Below you’ll discover 10 ways to be as happy as the Danes by adopting the concept of hygge. 1. Bring the Outside In. As you can see in the definitions of hygge which I shared with you above, an important part of hygge is turning your home into a sanctuary. You can begin to do this by incorporating natural materials in your décor—think materials that have been harvested from the earth, such as stone and wood. After all, nature is inherently calming and stress-busting. Bring items from nature indoors and use them as decoration. This can include river rocks, fruit placed in bowls, pinecones, branches, and so on. In addition, plants are an easy way to bring the outdoors in. Choose those that do well indoors, such as spider plants, aloe, succulents, fiddle-leaf figs or cacti. You can also pick up a bouquet of fresh flowers at the grocery store and put them in a vase next to your bed, or on the coffee table. Better yet, get several bouquets and place them all over your home. 2. Create a Reading Nook. 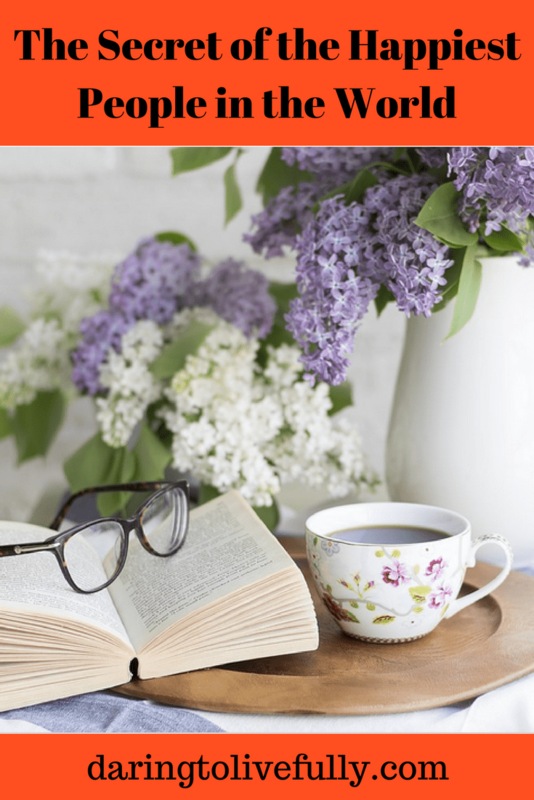 Bring even more hygge into your home by creating a reading nook, or corner. Few things say “comfort” like having an area in your home that invites you and your loved ones to sit back, pick up a good book, and get lost in its pages. A comfortable chair you can sink into. A foot stool so you can put your feet up. A side table to place a drink, and maybe a snack. A lamp, to make sure that you’ll have all the light you need. A quilt to wrap around yourself in case it gets cold. A basket filled with books and magazines. Sometimes, happiness is a comfy chair and a good book. 3. Hygge By Savoring a Warm Drink. A warm drink is almost synonymous with coziness. If it’s autumn, you can have some hot mulled cider or a pumpkin latte. In the winter, make yourself some hot cocoa with all the trimmings, a hot toddy, or some hot buttered rum. A cup of green tea is good in any season. Try my new favorite – Yogi Green Tea Kombucha. And be sure to add half a teaspoon of raw honey. You get extra hygge points if you serve the warm drink in a great mug. I love art, and my favorite art movement is Impressionism. I’ve owned many coffee mugs throughout the years that feature Impressionist paintings. Just looking at one of those mugs makes me happy. Of course, it’s not just about having a warm drink. It’s about being fully present as you wrap your hands around the mug, inhale the fragrant steam, and drink sip by sip, fully appreciating the moment. One of the pillars of hygge is atmosphere, and few things create a warm and inviting atmosphere more readily than candles. Think tea lights, candles in jars, lanterns, the lot. Set individual candles here and there, and group several candles together on a table. Once your candles are arranged, enjoy the serene glow. As an added bonus, if you get beeswax candles , you’ll also be purifying the air in your home (beeswax candles produce negative ions when burned, and those ions help to neutralize pollutants in the air). If you’re not a candle person, at least turn off the overhead lights and use table lamps for light to give your home a warmer feel. 5. Host a Game Night. Another of the pillars of Hygge is community and togetherness– spending time with friends and loved ones. And there’s no better way to spend some quality time with those who are important to you than to host a game night. Set out a cheese platter and serve some wine. Then, take out all your board games, and let your guests choose what they want to play. 6. Cook Some Comfort Food. Readers of this blog know that I love learning new things, and the latest thing that I decided to teach myself is cooking. One of the first things that I learned to cook is a dish that’s very common in Latin America: sancocho de pollo — a type of chicken stew. There are many variations to sancocho, but the one that I make involves chopping onions, scallions, garlic, tomatoes, and cilantro. You add chicken drums, root vegetables (otoe, ñame, and yuca), corn on the cob, spices, and water. Then you let all that goodness simmer for about an hour. And, of course, once it’s done, it’s delicious! Slow food—taking the time to cook something delicious and then sitting down to enjoy it—is very comforting, and very hygge. 7. Have a Candlelight Dinner. Now that you have candles, and you’ve prepared some comfort food, set a nice table, and sit down to a candlelight dinner. Make sure that you get yourself some dishes and place mats that make you smile whenever you look at them (I need to do this). 8. Make a Mundane Task More Joyful. If there’s something you don’t enjoy doing, but it has to be done, you can’t delegate it, and you can’t pay someone to do it for you, then find a way to make the task more joyful. Accept that the task needs to be done. Stop struggling with what is and don’t make things worse by putting it off or by complaining. Tell yourself that the problem isn’t with the task itself, but with your inability to fully appreciate it. Ask yourself how you can make the task more joyful. Do you need to turn it into a game by timing yourself, giving yourself points, or making up new rules? Would some music make the task more enjoyable? Can you tie it to something you like doing? Can you do it with somebody else? Sometimes all you need to make a task more joyful is to perform the task mindfully. As an illustration, as you wash the dishes keep repeating to yourself: “I’m now washing the dishes.” Then, be fully present as you soap and rinse the dishes. One way to practice hygge is to find ways to add joy to what you’re already doing. 9. Have an At-Home Hygge Movie Night. Choose what you’re going to watch. Some choices include: The Gilmore Girls, Vikings (this show is violent, but excellent), and Homeland. Find a great blanket or throw, preferably faux fur. Fill your sofa with velvety pillows. Wear something really comfortable, like a cashmere t-shirt or wool socks. If you have someone—or a pet—to snuggle up with, that’s great. But if it’s just you, that’s great too. Take a mid-morning break to enjoy some coffee with a small pastry. Use the five minutes that you have between meetings to close your eyes and listen to Chopin or Vivaldi (or whatever music you enjoy). Watch the sunrise and/or sunset. Sit in your reading nook with a great book. Take your dog out for a walk. Make a note of these simple pleasures in your gratitude journal so you can relive them each time you go over what you’ve written in your journal. As you can see from this post, hygge is about self-care, midfulness, and community, all rolled up into one. Live your best life by bringing more coziness and comfort into your life. Hygge!